Philip Levy, who passed away on October 12, 2017, held a BA in History from the University of Wisconsin-Madison (’68) and was a proud student of George Mosse, William Appleman Williams, Harvey Goldberg, and Robert Starobin. 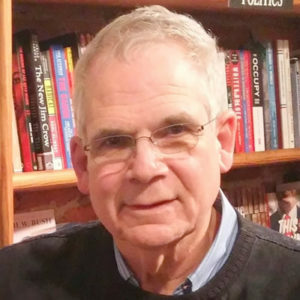 After working at IPS (a radical think tank), at The Old Mole (a Cambridge-based underground newspaper), for Ralph Nader, and as manager of the The Key Theater, Philip put his well-rounded, Madison education to use as a lifelong bookseller and owner of Bridge Street Books. A favorite of such bibliophiles as Mario Vargas Llosa, Azar Nafisi and Elvis Costello, Bridge Street has operated independently in Washington, DC for the past 35 years. For more about Philip’s life and achievements, please see the obituary published in the Washington Post on October 24, 2017, accessible at the Washington Post’s Website.